Origin: The lychee is native to low elevations of the provinces of Kwangtung and Fukien in Southern China. Cultivation spread over the years through neighboring areas of southeastern Asia and Africa's off shore islands of Mauritius. It reached Hawaii in 1873, and Florida in 1883, and was conveyed from Florida to California in 1897. Flowers:Fruits: The fruit is covered by a leathery rind or pedicarp which is pink to strawberry-red in color and rough in texture. The fruit shape is oval, heart-shaped or nearly round, 1 to 1-1/2 inches in length. The edible portion or aril is white, translucent, firm and juicy. The flavor is sweet, fragrant and delicious. Inside the aril is a seed that varies considerably in size. The most desirable varieties contain atrophied seeds which are called "chicken tongue". They are very small, up to 1/2 inch in length. Larger seeds vary between 1/2 to 1 inch in length and are plumper than the chicken tongues. 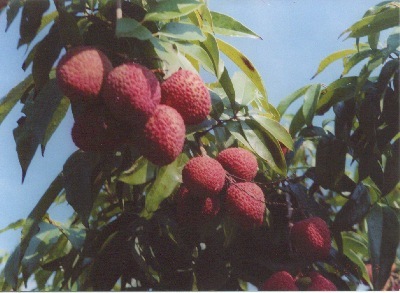 There is also a distinction between the lychee that leaks juice when the skin is broken and the "dry and clean" varieties which are more desirable. Lychees are eye-catching in spring when the huge sprays of flowers adorn the tree. Flowering precedes fruit maturity by approximately 140 days. The leathery, pinnate leaves are divided into four to eight leaflets. They are reddish when young, becoming shiny and bright green. Lychee trees have full foliage and branch to the ground. The lychee tree is handsome, dense, round-topped and slow-growing with smooth, gray, brittle trunk and limbs. Under ideal conditions they may reach 40 feet high, but they are usually much smaller. The tree in full fruit is a stunning sight. When planting a Lychee, hole preparation is the same as for planting avocados. If planting marcots directly, most leaves should be removed. A round of hog wire covered with plastic gives excellent wind protection and also holds moisture in. In case of a freeze, one has only to throw a blanket over the top. The plastic should not touch the plant. This protection should be planned on and taken care of the day the plant goes into the ground. Pests and Diseases:Harvest: The Fruit must be allowed to ripen fully on the tree. Overly mature fruit darken in color and lose their luster. The flavor lacks the richness associated with a certain amount of acidity. To harvest, snip off entire fruit clusters, keeping a short piece of the stem attached. Lychees can be stored for up five weeks in the refrigerator. They can also be frozen or dried. Lychees will begin to deteriorate within three days at room temperature. Mites, bluegreen weevels, scale and aphids occasionally infest lychees. Birds are often attracted to lychees, eating both the immature and the ripe fruit. It may be necessary to cover the plants with a protective netting. Air-layering is the most common method of propagating lychees because grafting is difficult and seedlings are not reliable producers of quality fruit. To grow a plant from seed it is important to remember that seeds remain viable for no more than a day or two under dry conditions. Young seedlings grow vigorously until they reach 7 or 8 inches in height. They will stay at this height for up to two years without further noticeable growth. Wedge and bud grafts are possible, but seldom used. Lychees need warmth and a frost-free environment, but can often withstand light freezes with some kind of overhead protection. When they are young, this can be provided by building a frame around the plants and covering it with bedding, plastic sheeting, etc. when frost threatens. Electric light bulbs can also be used for added warmth. Prune young trees to establish a strong, permanent structure for easy harvest. After that, removing crossing or damaged branches is all this is necessary, although he trees can be pruned more heavily to control size. V-shaped crotches should be avoided because of the wood's brittle nature. Young trees tend to grow slowly, and many gardeners tend to give them too much fertilizer in an attempt to push them along. Young trees should receive only light applications of a complete fertilizer. Mature trees are heavier feeders and should be fertilized regularly from spring to late summer. Chelated iron, zinc, nitrogen, phosphorous, magnesium, manganese and soil sulfur may be necessary in areas with alkaline soils. The lychee will not tolerate standing water, but requires very moist soil, so water the tree regularly when it is growing actively. The trees are very sensitive . The tree needs a well-drained soil that is rich in organic matter. A soil pH between 5.5 and 7.5 is acceptable, but plants grow much better in soils with a pH at the low end of this range. Apply a thick layer of organic mulch to the soil after planting. Large, conical or wedge-shaped red fruit with soft flesh. Slightly acid with fully formed large seeds. Fruits heavy every other year in South Florida. Mid-season fruiting, (late June thru early July). Large, vigorous, upright tree. Medium-red fruit sometimes with green tinges with soft skin. Flesh is crisp sweet and occasionally pinkish. Tends to have all chicken-tongue seeds. Ripens early. Medium size, slightly oval, reddish-brown fruit. Firm, good-quality fruit. Tends to have a mediun size seeds, fruits most every year and is used as the commercial crop in South Florida.